Forgiveness? Do to others whatever you would like them to do to you. When Jesus started teaching, people heard His teaching was different. People gathered around Him, and those who flocked around Him were not powerful nor well-respected from others. They were needy, morning, humble, hunger for justice, and yearning for mercy and peace. 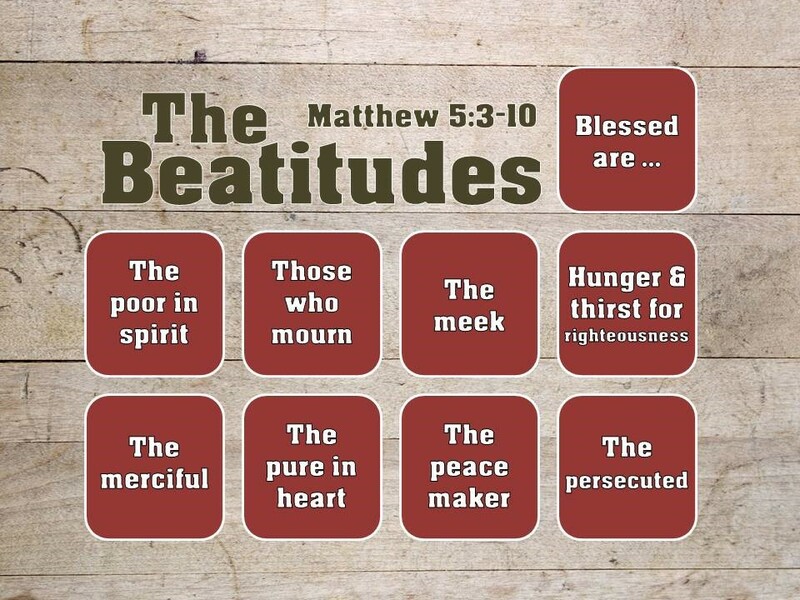 Jesus looked around the people in needs, especially spiritually, and spoke to the people about the most precious message of them – the Beatitude, which was full of God’s mercies, comforts and blessings to them around Jesus. Blessed are the poor in spirit, those who mourn, the meek, Hunger and thirst for righteousness, the merciful, the pure in heart, the peace maker, and the persecuted for His name’s sake because a great reward await in Heaven. No other teachers and the religious leaders at that time could give such a comforting and blessed message. Those teachers and religious leaders forcefully demanded the people to follow their rules and traditions. If not, a heavy penalty was imposed to those who did violate the rules and traditions. No leaders gave a comfort and peace that the people were yearning for. The people was in hunger for comfort and peace, but they could not be satisfied. Jesus Christ was different. Jesus made them satisfied. 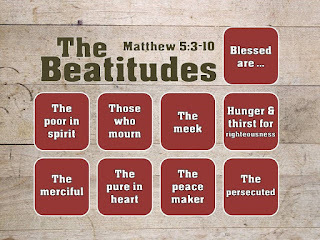 Upon hearing Jesus’ Beatitudes. They were comfort because the message about the Beatitudes was exactly what they wanted to hear for a long time. 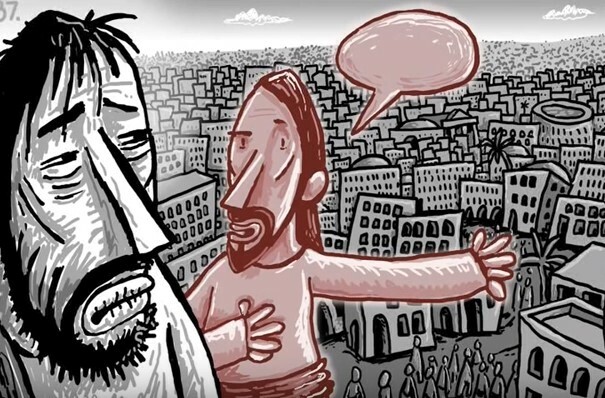 Finally, the people heard the comforting message from Jesus (Matthew 5:3-10). Jesus brought the much needed peace and comfort in the most merciful way that touches the hearts of those who listened to Him. I believe nobody (especially we who believe God) intentionally harm others. Unfortunately, the imperfectness of this world and our sinful nature, although we don’t want, we have ended up offending, trespassing and sinning against others. Yes, most of times (if not always), later, we do realize what we did wrong to others – offending, trespassing and sinning against them. That puts us in pain from the deep in our heart. Of course, we, believers, pray to God his forgiveness and search for an opportunity to ask forgiveness from those whom we did wrong to and make up for our wrong doing. We usually think about the side of offending and doing wrong others. How about the opposite? Suddenly without a reason, people around us (including those whom we really give our love and respect) stop trusting, and oppose, offend, give harm to us as if they try to punish us on something that we did wrong to them although we have never given any harms to them. Then our mind starts analyze why, while searching for a clue why they suddenly act differently. Our hearts are being perplexed, and even saddened by the unfolding sad event. At a same time, our defense mechanism started protecting us from any further damages from them by building up a barrier against them as if they were enemies. As time goes, if the situation does not improve, our heart is getting hardened against them and start to question whether they are impossible or even unforgivable. Our righteous mind slowly kicks in declaring a war against the unrighteous enemies, while forgetting they were our dear friends and family members. Our hearts even starts wanting to see a justice – punishing the offending people, while we are being vindicated before people around us. Jesus taught the opposite -- not to search for a justice to be even (especially in our own eyes), which could lead to another higher escalation of conflicts between us and them – a vicious cycle to a total annihilation of relationship between us and them. This is one of the sweetest temptations that we can get through justification of our mind and heart. However, Jesus teaches us to truly forgive them from our hearts. If not, Our Father will not forgive us either. Can we truly and unconditionally forgive those who sinned against us and whom we loved and cared for a long time? Countlessly many families are suffering from this unforgiving heart because we loved and cared for so much our family members until getting into a situation of hurting and being hurt. We love them so much. Thus, our pains are so great. This pain is even greater when we are hurt by our heaven-bound eternal family member, such as among members from a same church, a Bible study group, a fellowship group, etc. What really this means? We cannot win the war against our sinfulness, which is deeply rooted in our heart, and it is a part of our nature. Then how to battle against ourselves? There is only one solution. 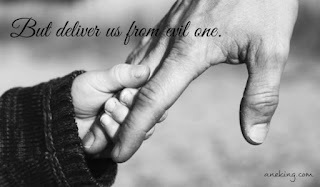 We must hold on tight our Father Hand, the Almighty and Ever-Loving God’s Hand. Surely we will be defeated again and again if we rely on our own might. If we rely on Him and His power, our victory is sure. It is also true that holding His hand tight also requires our intentional efforts and prayers in Him. It will take time, but staying in Him is much more secure, and without knowing, we will soon realize we are grown in Him while having a deepening relationship with Him. Do we really want to be forgiven by others for our mistakes or something that we did although we really did not want but we did due to the uncontrollable situation? Jesus was led by the Spirit into the wilderness. For forty days and forty nights he fasted. Why was Jesus sent out to the wilderness for forty days? Jesus experienced the very nature of humans that we all have since we have borne in to this world: the craving desire of food after his forty days and nights of fasting in the wilderness as a human being. Nobody was there. Jesus was alone for the forty days and nights. Being alone in the wilderness itself was also a mental torture. The weakening physical body made Jesus even harder to bear his loneliness. His physical body condition was pushed up to the limit from the hunger, and He was hallucinating with his basic needs of food. His body’s strength was completely exhausted, and even the shadow of the physical death was hovering over him. The first temptation from the devil is testing the human aspect of Jesus’ desires of the flesh. Nobody cannot deny this basic desire of body, which is so deeply intertwined with our own existence on earth. Not having food means death to our physical body, i.e., ceasing existence on earth. This desire is not unique to humans, but universal to all living creatures on earth – cling to its physical existence on earth. 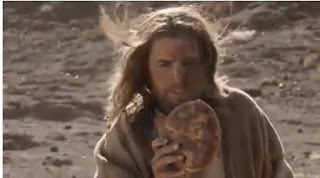 The devil tempted Jesus by tapping into this very nature, when Jesus was very weak and in the extreme craving for food. 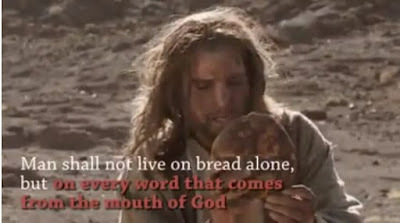 Jesus told that we are not just a physical creature simply existing in this physical world strives for existence on earth only, but we are God’s children, who are spiritual beings that grow and are nurtured by spiritual food, which is God’s Word. Yes, our inner spiritual beings need food to nourish our spirits in us. Jesus revealed the true secret of our true nature of being children of God. How often have we giving a really serious consideration on our inner spiritual being when we make an important decision in our lives? The devil was defeated. Jesus resisted the very basic human instinct and solidly declared: we don’t live by bread alone, but the Word of God. However, the devil was not deterred by his initial defeat. Then the devil took Jesus to the holy city, Jerusalem, to the highest point of the Temple, and said, “If you are the Son of God, jump off! For this time, the devil remembered his defeat due to the usage of God’s Word by Jesus. The devil, thus, decided to use God’s Word to tempt Jesus. The devil first set a tricky condition to trap Jesus with God’s Word, “If you are the son of God.” The devil put Jesus into corner. If you agree this statement, then why not jumping off from the temple top. Then God would order His angels to protect you as written as God’s Word. What a cunning temptation -- falsely applying the Word of God to a situation that was artificially created by the devil! Jesus was tempted by the devil with God's Word. Such a temptation is actually more common that we think because we don’t have to go far to find an example. Let’s look back. How many times have we artificially created a condition that God's Word serves our needs, and justify what we do and or even glorify what we do in the name of God? Jesus took out the cunning motive of the devil, and proclaim God’s absolute sovereignty. In fact, we all love to manipulate God to serve our own desires. Yes, most of us would quickly deny that we have never tried to manipulate God to server our needs. Please look back. How many times have we prayed to change God’s will to have what we want instead of changing our desire to fit into God's will? Even have we quoted Bible verses to legitimize our needs in prayers? In fact, our prayers are our intimate conversation with God. 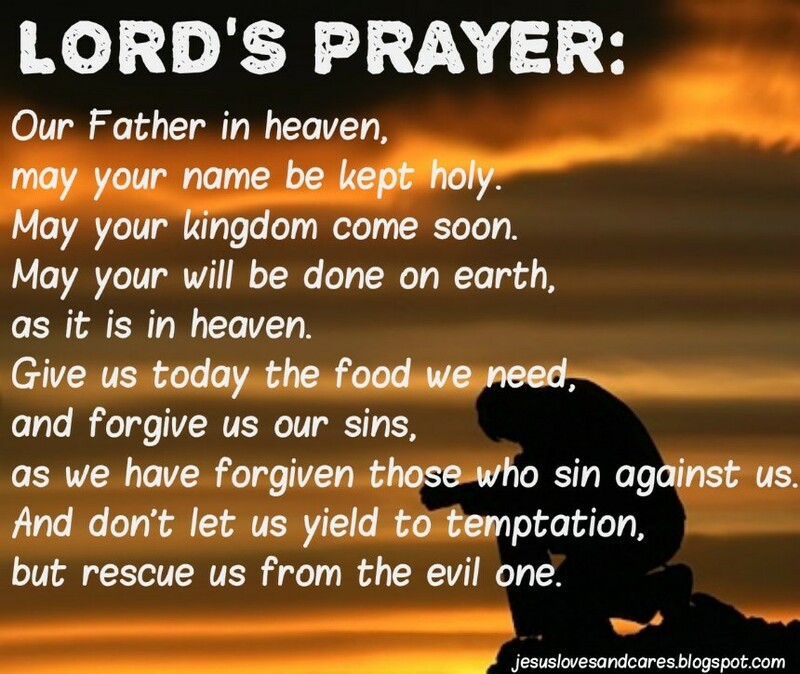 Through prayers, we, as a mere human, talk to God and hearing God’s voice and His will rather than the other way around – forcing God to answer our desires in prayers. But Jesus directly countered the devil’s temptation with the Word of God. Again, the devil failed. Jesus resisted the devil’s temptation with God’s Word. Next the devil took him to the peak of a very high mountain and showed him all the kingdoms of the world and their glory. Now, the devil took Jesus to the peak of a very high mountain and showed him all the kingdoms of the world and their glory. This is the test that is most subtle and most powerful - tempting the desires of our eyes. I want to boldly say that our modern economy is built around of the desires of eyes. Why are we getting up early and working late? Do we have enough? If we have enough food to eat, then what else we need? Even so, we constantly crave for a new thing -- such as a smart phone, a new car, a new house, a new computer, etc. Why? Because we have seen such things, which looks so shiny and tempting enough to our eyes to tickle our desires to own it. Remember that the first sin of all humanity came through this temptation. Eve and Adam were trapped in the desires of eyes: So when the woman saw that the tree was good for food, and that it was a delight to the eyes, and that the tree was to be desired to make one wise, she took of its fruit and ate, and she also gave some to her husband who was with her, and he ate. 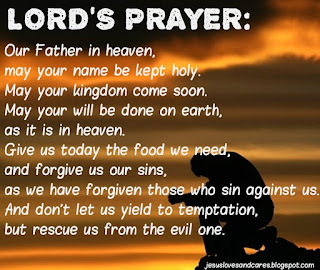 (Genesis 3:6) The power of temptation from the desires of eyes is so great that once we fall in the desires of eyes, we will surely be a prey of the desires of eyes. “Get out of here, Satan,” Jesus told him. 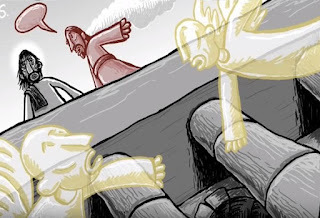 Jesus immediately stopped the Satan (i.e., the devil), and ordered to get out of here, Satan. Jesus had never been violently responded to the devil even when he tempted Jesus except this case. This gives a Godly wisdom to us. Don’t be associated with the Satan, when tempting us with the desires of our eyes. Please remember that this temptation was so seductive and powerful that the first sin came through this. The best response is to immediately reject the temptation with the power of the Word of God as Jesus did. This was the moment that God’s salvation plan through Jesus on earth had begun. God sent Jesus Christ, and God was pleased with Jesus. 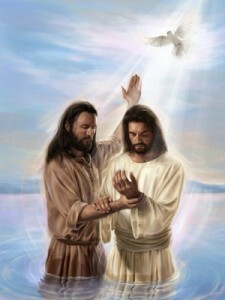 Jesus was humbly baptized by John the Baptist, and God was glorified. People saw God’s glory on Jesus, and Jesus’ ministry on earth was ready. Soon Jesus was led by the Spirit into the wilderness to be tempted there by the devil. For forty days and forty nights he fasted and became very hungry. Please look back into our live. Dedicating ourselves to God and doing God’s work was not easy. How many times have we experienced the devil’s power and interference, as soon as we dedicate ourselves to God to do God’s work? The first temptation from the devil was the most essential part of all living beings – food for survival. For forty days in the wilderness, Jesus had been fighting against this extreme hunger. After the forty days, Jesus fell on ground, barely breathing. Jesus experienced our human body’s fragility, and the inexpressible craving for food for survival. The taste of death was circling around his fragile human body, and the mind was hallucinated because his mind was generating all kinds of mental pictures of craving for food. The pain was unbearable, and his body gave up all of his strength. He fell on ground. He barely breathe through his mouth. His mouth was as dry as desert, and it opened like an open grave. He was about to expire as the shadow of death was hovering over Jesus. On the other hand, to the devil, Jesus was well prepared for his easy victory. The devil might thought that nobody, even Jesus, could overcome the human basic needs, i.e., food after forty days of hunger in the wilderness. What an answer! Nobody on earth can give this answer under the extreme hunger. 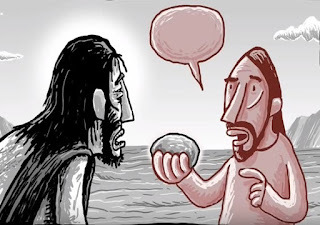 Yes, Jesus had a power to turn the stone to a loaf of bread. Please look at His face. He was in pain, but he was in joy. He absolutely trusted God, while looking forward to seeing our salvation through Him in His love even under the extreme physical hardship and the temptation. All of us cannot deny our physical body’s needs – food, shelter, and clothing. These are our basic instinct deeply programming in our nature. Some say about noble causes and lead people, while telling not to live to satisfy these basic needs but for the noble causes. However, how many can actually live out their own noble causes, and continue loving their followers under an extreme agony as Jesus had experienced? I saw many of them ended up satisfying their own earthy needs first, and if needed, scarifying those who believed the noble causes and followed them. After all, their kingdom belongs to earth. 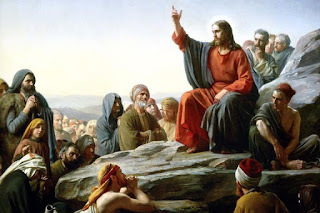 Jesus told to His disciples "My Kingdom is not an earthly kingdom. If it were, my followers would fight to keep me from being handed over to the Jewish leaders. But my Kingdom is not of this world." (John 18:36) His kingdom not of this world, but in Heaven, which is eternal, not tangible like anything on earth. Friendships and love are beautiful and even noble on earth, but even they don’t last forever, if they were attached to this world. However, God’s love is unconditional and endures forever. The true purpose of Jesus, who endured the extreme hunger and the unbearable temptation was to give us this love and the everlasting life in fullness. Praise the Lord, who endured all things including the excruciating hunger, pain, humiliation and temptation on the cross, the separation from God, the Father, and the death on the cross! Absolutely these are beyond our imagination. It is not the end of the story. Jesus Christ conquered the death and rose again. Through Him, like Jesus, we will rise again. We will be suddenly changed like Him at the sound of the trumpet of the second coming of Jesus Christ. Sing praise to God, our Father, His Son Jesus Christ, and the Holy Spirit, who dwells in our heart! God called Abram, and told Abram. Abram heard God’s voice, and left his home because he believed God, who would give him a land of flowing milk and honey, and make his descendants as numerous as starts on a clear night sky, not like a murky night sky today. I still remember one clear night on a remote place where everything was so dark that even I was not able to see even one inch ahead of me. The sky was pitch black. However, it was packed with bright stars. All of them were crystal clear as if somebody picked an individual star, washed, and polished before placing it back to where it was. Then there was a spectacular scene of the Milky Way that was towering out of the horizon ahead of me, and closing the night sky till reaching the other side of the horizon until the last star barely hid to the horizon. I felt that I could even touch the stars, if I had a long arm because they were so clear and bright. The splendor of the awestruck display of the countless crystal stars that I can see even today, if I close my eyes. Whenever I read Bible about Abram, I could imagine how Abram felt when he conversed with God while watching the stars on the night sky. He was completely overpowered the splendor of the night sky and the stars. Anyt attempt to count starts was even foolish to Abram. He saw God who was greater than anything that Abram could imagine. Abram was 70 years old, when he was called by God. Upon calling, he left Haran only because of the Covenant with God: The LORD had said to Abram, "Go from your country, your people and your father's household to the land I will show you. God made a promise to Abram, and Abram believed. What a blessing to Abram! 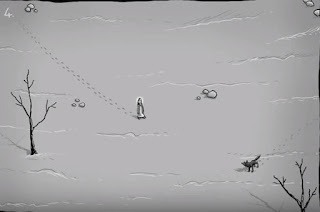 After a long journey, he arrived the land of promise, but the land was plagued by famine. 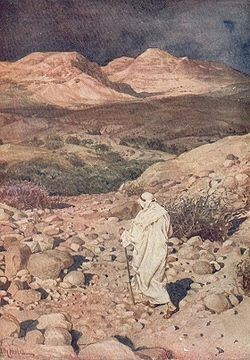 He could not stay on the promised land, and had to make a journey to Egypt, where he lived as foreigner. Then God made him return to Canaan, the promised land. On the way back, he had to be separate from Lot, his nephew, because Lot wanted to be independent. He split his wealth and gave to Lot. Then he continued to journey back to Canaan and settled. Did God already know about the above Abram’s response even before Abram responded? Yes, I believe so. God immediately responded by stopping his plan and added yet another even greatly blessed Covenant: “This man will not be your heir, but a son who is your own flesh and blood will be your heir.” He took him outside and said, “Look up at the sky and count the stars—if indeed you can count them.” Then He said to him, “So shall your offspring be.” (Genesis 15:4b,5) Then Bible immediately records, “Abram believed the Lord, and he credited it to him as righteousness. (Genesis 15:6) Yes, Abram believed, but in fact, he was convinced by God under the beautiful, majestic scene of the night sky filled with countless crystal clear bright stars. Under the majestic scene, Abram was able to see how pitiful his plan was --- fulfilling God’s Covenant by his own hand. He quickly realized that he was utterly foolish. Immediately, Abram humbled himself before God, and believed God. The gracious God counted him, who believed Him, righteous. This is how God works with His people, as our parents do everything to prevent from their 3-year old small child to do a wrong thing even though he/she thinks doing a right thing. God is our True and Ever-Lasting Father with full of love, compassion and grace, who always loves us with the best. After God counted Abram righteous, did everything go well for Abram? No. Abram had to go through another test. His wife, who was also in great stress of not having a baby, proposed a tempting plan -- making a son with her servant girl, Hagar. Sarai knew and believed she was barren. Abram accepted. However, this sin led to a serious domestic conflict between Sarai and Hagar. When Hagar knew she had Abram’s baby in her womb, Hagar despised Sarai. Sarai made a plea to Abram, but Abram’s respond was cold. Out of the pain, Sarai plot against Hagar, and made Hagar leave the Abram’s house. What a dysfunction family! God could not let them alone. God intervened. God, who was merciful and full of love, came to Hagar first. She was wondering in wilderness. In the wilderness, she was even struggling to find drinking water. God brought Hagar back to Abram and Sarai. Hagar, then, bore a son, Ishmael when Abram was eighty-six years old. Abram followed God for 16 years since God’s calling. When Abram’s age was 99, God appeared to him and said, I am God Almighty; walk before me faithfully and be blameless. Then I will make my covenant between me and you and will greatly increase your numbers.” (Genesis 17:1b-2) Please note that for the first time, God gave a warning. “Walk before me faithfully and be blameless.” Why did God tell this warning? By that time, Abram had gone through many things in his journey with God. Yes, Abram failed multiple times, but he had never forgotten God, and believe Him as the source of blessing and promise. It was not a blame, but God wanted for him to grow spiritually and have a deeper relationship with Him. Upon seeing Abram’s spiritual growth, God granted a new name, Abraham, because he was no longer Abram. He was ready for a new life in God. God gave a new Covenant -- Abraham as a father of many nations, not just one nation. Additionally, God made his covenant as an everlasting covenant between God and Abraham and Abrahams’ descendants after Abraham for the generations to come, to be Abraham’s God and the God of Abraham’s descendants after Abraham. As God promised, Abraham became the father of Israel, and most importantly the father of all believers today. Praise God, who is merciful and full of love! As He did to Abraham, God who started a good work in our lives will surely complete. This is the promise and our true hope in Him. Praise the Lord! His mercy endures forever. Amen. Abram followed the advice of his wife, Sarai, and slept with Hagar. She became pregnant. When Hagar realized this, she became very proud and began to feel that she was better than Sarai her owner. She, then, despised her owner, Sarai, with contempt. Sarai thought that her problem of not having baby would be solved by letting her servant Hagar have a baby. It was not the case. She had never thought that Hagar would look down on her after getting pregnant with her husband’s baby. Yes, it was a good idea for Sarai to have Hagar to have her husband’s baby. This let her get rid of the enormous pressure of not having a baby for he husband, Abram. How many times have we experienced that our good idea to resolve a life-long problem with our own hand and wisdom ended up a situation that is much worse than the initial situation that drags us down to many sleepless nights? We regretted of not being patient and waiting for God because we could not handle those messes that we introduced into our lives. It is true that it is much difficult to say than we actually do. Waiting for God’s answer is always much harder than we think, because God is invisible. Especially, when we have been waiting and waiting for a long time, our patience is completely depleted. The waiting drains out our heart and mind. After our long waiting, there is no sign or hint that the God’s promise actually will come. Waiting itself becomes an unbearable burden and our struggle. We are fearful about dawning a new day, because our heart tells, “I am sure it will be another day that makes me disappointed because the promise will not come as it did yesterday, the before yesterday, and two days ago, so on. Additionally, one part of our heart starts shouting that there is a solution that really works. Why waiting? Just do. As Bible say, Sarah gave up, and Abram also did. They agreed to do what was logical for their eyes because they wanted a closure. Yes, waiting without any evidence (and with a sign that the opposite would come) is most daunting to any of us. However, the battle was not over. A bigger battle was just started. Sarai had to endure Hagar, who looked down on Sarai, her owner. Sarai could not bear any more. Sarai came to Abram, and she blamed at her husband: “This is all your fault! I put my servant into your arms, but now that she’s pregnant she treats me with contempt. The LORD will show who’s wrong—you or me!”(Genesis 16:5) What did Sarai say? She did not stop blaming Abram, but she used God to justify her and her innocence. To many of us, this sounds very familiar. Why? We all have done this before not just once, multiple times. We might still say to our heart that it was not my fault and God made me to it due to the uncontrollable situation. Transferring our guilt to others by blaming them is a sin. Additionally, sealing off our sinful behavior by introducing God is even more abominable. Sarai exposed one of the shameful parts in us. What was the Abram’s response? Did Abram respond Godly to her loving wife, Sarai? No. Abram said to Sarai, "She is your slave. You can do anything you want to her." 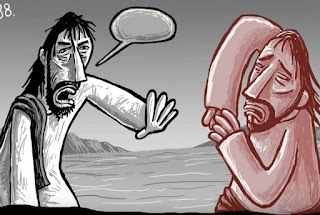 (Genesis 16:6a) Abram’s answer was cold, first. He was Sarai’s husband, the head of the household before God, but he completely ignored all these. He was responsible to take care of Sarai simply because she was his wife, who was a weaker vessel before God. Instead his ears quickly picked up the blame voice coming from Sarai’s mouth. Then his heart was fixated on the blame rather than being a loving and caring husband in the time of suffering. Yes, he could have been more patient than responding with his stone-cold answer. For Abram’s point of view, he had been in a long suffering. Pressing down his frustration itself was so difficult that there was no room to deal with her criticism. He was already on the edge. Didn’t Abram know what was happening between Sarai and Hagar? No. It was one of the difficulties that Abram had to deal every day. Abram saw Hagar who mistreated Sarai, not just once, but day after day. His heart was heavy, Additionally, he started wondering about his baby is in the womb of Hagar, not Sarai. Every day his heart told to Abram that what he did was stupid, wrong and sinful. When Abram heard Sarai’s criticism, it directly went down to the center of his heart, and precisely pierced the source of all the pains that he suffered from. Every day, he regretted his stupid behavior, and he wanted to get out, but he could not. Abram had to transfer the frustrating burden to Sarai. What, then, was Sarai’s response? Sarai treated Hagar harshly till Hagar ran away. Another typical behavior that we can find among ourselves. Sarai really wanted to get rid of Hagar. However, if she expelled Hagar, it would easily for her to be blamed. On the other hand, Hagar would get a sympathy from people. The best approach (according to human wisdom) is to make Hagar to choose to go out by her own decision, not by Sarai. Her plan was successful. Hagar finally left the Sarai’s house. Of course, God who saw the deepest part of our heart knew exactly what was going on between Sarai and Hagar. Yet, another sin was added to the household of Abram and Sarai. Hagar, who left the house of Abram and Sari, soon found that she was suddenly surrounded by wilderness. Even there was no drinking water, let alone food that she used to enjoy when she was at the house of Abram and Sari. She was thirsty, but she had no idea where to go to find water. What she saw was a dry and barren wilderness before her eyes. Her hate feeling on her master, Sarai, which was so intensive when she left the house. Now, it became a distant voice in her heart because she had to survive in the wilderness. Her mouth was dry. Each step of her was getting heavier, and her mind was overtaken by her thirstiness. Passing through this wilderness she might have not noticed, but her heart was getting cleansed by this harsh reality. God, who is always merciful, guided her footsteps to a spring of water in the middle of the wilderness. She was able to make her satisfied with the water of the spring. She sat down and looked up sky. Her face was filled with an empty look. She had no place to go. Her future was uncertain. She was quite. Her heart was no more filled with the anger and hatred because her heart was emptied. Then the angle of God appeared to Hagar, and said “Hagar, servant of Sarai, where have you come from and where are you going?” She said, “I am fleeing from my mistress Sarai.” (Genesis 16:8) Did the angel not know where Hagar came from and where she were going? No, the angel exactly knew what was happening. Upon this question, Hagar answered, “I am fleeing from my mistress Sari.” Only she answered where she came from. She had nothing to say about where she was going because she had no place to go. The angel saw her heart that was ready, not like that at the moment she ran out of the house of Sarai. The angel of the LORD said to her, "Return to your mistress, and submit to her authority." (Genesis 16:9) She quietly listened to the angel of God, and did what was told to her. If this was told to Hagar even by the angel of God, first, she could have not been able to listen to this voice, and second, although she have had heard this voice, she would flat rejected. Her heart was filled with anger and hatred from her pride. God took out her pride and greed so that she was ready for God’s plan. She returned and bore a son. Abram called the name of his son, whom Hagar bore (not Sarai), Ishmael. Abram was eighty-six years old. The house of Abram was divided by the multitudes of sins of Abram, Sarai, and Hagar. Hagar despised Sarai, her owner. Sarai blamed at Abram using the name of God. Abram, who was too wrapped up his own problem, responded ungodly to his wife. Sarai harshly dealt with Hagar as a part of her plot of expelling Hagar from her own house. Hagar with full of rage left the house of Sarai, her owner. It was a dis-functioning household with full of hates. Nobody wanted to do good to bring back the family. God could not let them alone, but intervened their lives. Starting from Hagar, Sari, and Abram, God amended the broken relationship and brought back to one family. This is the love of God. We are one in His love, not because we are righteous, but we are simply His children. Although we are sinful (varying degrees by our own eyes, which often lead to our judgmental thought and behavior before God), God loves us. God is love. … There is no fear in love. But perfect love drives out fear, because fear has to do with punishment. The one who fears is not made perfect in love.